Who knew? Some bands explode into our consciousness with a flurry of publicity and a barrage of pop missiles. Others creep up on us over a matter of years. And then you get Bloc Party. About a year and a half ago this writer first glimpsed our heroes at a DiS gig, then named Union, and frankly, to her mind at least, they were not very good. They were a bit Sonic Youth-y, and a bit Strokes-y, as so many young bands seem to be, and distinctly lacking in style, identity or musical flair. And then something sudden seemed to happen, and they changed their name, and set about morphing into one of the most exciting UK bands of the past two years, and that deep-ingrained, cunningly spotted potential burst forth. It's already somewhat a given that Bloc Party are going to do very, very well indeed. Yet all the angular pop pickings and fiery live shows in the world couldn't have prepared us for this record. The detractors who expected sixty minutes of Gang Of Four covers are in for a shock. 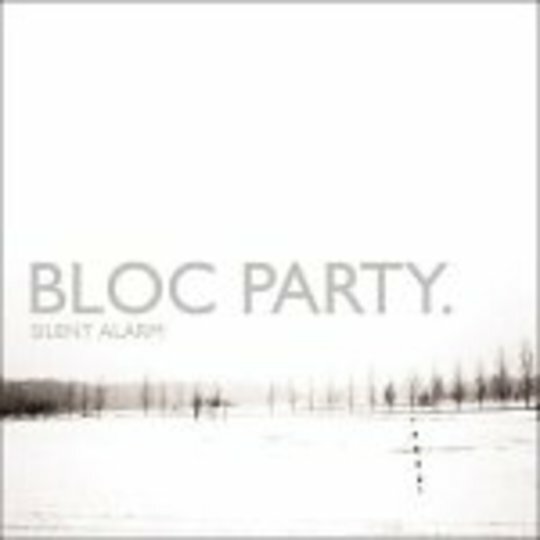 Silent Alarm is a remarkably mature, expansive record. It's clear that Bloc Party have wanted to experiment from the word go; first step, turn down a Parlophone deal for a Wichita contract. Second step, fill your debut with weird noises and B-movie echoes, layered over compelling, jerky songs. The singles are by no means the sole highlights on Silent Alarm. From the opener 'Like Eating Glass', it's clear that the bar has been set high. Shrill, grasping and desperate, its urgency sets the pace for the whole record, Kele Okereke's vocals ringing out like a frantic siren. 'Pioneers' is wordlessly gorgeous, and old single 'She's Hearing Voices' has been reproduced and tinted with a hollow, ghostly hue that replaces the original version's tinny sound. It's a trick that's echoed later on the soopafine 'Price Of Gas', arguably the record's peak; desolately urban, unsettling and alien, it's the sound of the Specials being methodically taken apart by Le Tigre, eerie two-tone rumblings being devoured by Okereke's peculiar, high-pitched and in places androgynous shouting. Silent Alarm's not 100% filler-free - the forgettable 'So Here We Are' could have slipped out the back with little protest - but the autonomy, creativity and sheer, elastic beauty that spans this debut more than justifies the rapidly accelerating hype that Bloc Party are currently generating. Any of the lazy comparisons that initially dogged them are firmly laid to rest beneath the floorboards of Silent Alarm; if Bloc Party ever sounded like the Strokes duelling with Gang of Four, they don't anymore. Frankly in places this record sounds more like the Police (in a good way, mind), and sublime album closer 'Compliments' wears shades of Ultra-era Depeche Mode, saturnine and serpentine, winding languidly through the confines of your headspace. More than the sum of its influences though, it's an addictive, pulsing and innovative record that confirms Bloc Party's status as one of our most essential bands and showcases how exciting British music is capable of being right now.